A repetitive and painful condition, tennis and golfer’s elbow is caused by small tears or inflammation in the forearm muscles. At Complete Care Chiropractic, we may offer solutions to treat your condition with our many healthcare practitioners. 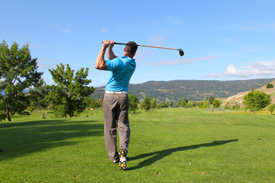 Golfer’s elbow is usually due to tightly holding the golf club, while tennis elbow is often caused by a faulty backhand technique. There are recommendations our practitioners can make to improve your game, such as using both hands for a backhand, getting a larger size racquet head or employing a looser tension on your strings. We’re happy to co-manage your case with other health practitioners. Schedule your appointment at our three Perth-area locations today!